Our custom built home is located in Killington on an acre of land, on a paved town road with other vacation homes. A second story has been added to make it bigger and even better. We have just (November 2018) had the entire inside of our house repainted and all new carpeting installed. It looks great! The house now has a large kitchen-dining area on the first floor with a 24' cathedral ceiling and a large new Vermont Castings wood stove. Also on the first floor are 3 BRs (two with a double in each, the third with two twin beds), 1 &1/2 baths, an indoor sauna, and a shower room for two. A 'sun burst' pattern of antique skis and bamboo poles is displayed on one wall, with more antique skis, snowshoes, and an antique sled displayed on other walls. The second floor has a bedroom (one queen), full bath, a living area which extends the length of the house (40') and includes a sleeping alcove with a Murphy bed. There are two sofas , several chairs and a recliner as well. The living area affords a winter view of the Green Mountains beyond the trees. A sliding glass door exits onto a large deck which descends to another deck facing the woods. The living area extends 17' into the house to a balcony overlooking the first floor dining area. The new outdoor hot tub seats 4-5 comfortably, and is located on the upper deck. Summers are wonderful at Killington. Hike the Long Trail, take the lift up to the top of Killington with your mountain bike and ride the trails down, golf, swim, play tennis, or sit on the deck of the The Foundry, a great restaurant on the access road, and watch the sun set. If you're really feeling lazy, just sit on our deck, and listen to the breeze stir the leaves in the trees. In the evening, light a fire in the chiminea on the deck, and sit back and watch the flames, or look up and count shooting stars. In order to keep our rates down,the rental does not include bed linen or towels. These may be provided at a cost of $15 p/p. Blankets and pillows are provided. I am a retired New York City teacher, and my wife is a retired nurse. 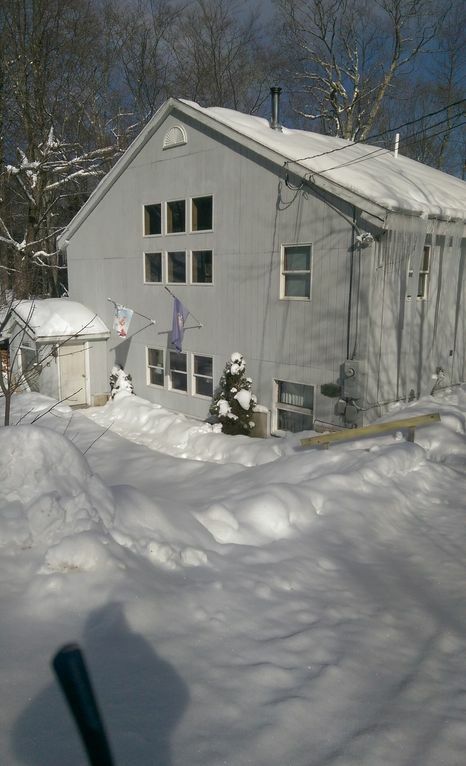 We bought the property when we started skiing at Killington in 1968, and built our house in 1979-80. We added the second floor in 2003 to make room for our growing family. When we were thinking about what kind of vacation house we wanted, we made the decision to make the living areas as large as possible. The location of our house makes it possible to get to the slopes and area nightlife in a matter of minutes, and yet allows for the kind of peace and quiet that a condo can't compete with. We have both keurig and drip coffee makers. Full china and glassware services, full cutlery and silverware, full kitchen utensils.